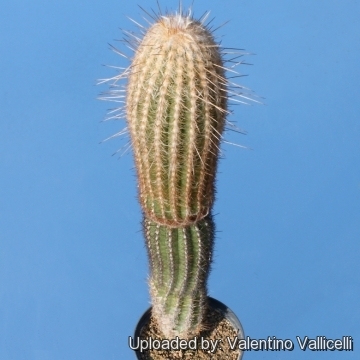 Cleistocactus lanatus (Kunth) F.A.C.Weber in Rol.-Goss. It makes a beautiful individual specimen with hair as fine as the finest spun silk and a lustre which can only be called sheer. Espostoa lanata f. cristata hort. Cereus lanatus subs. sericatus (Backeb.) Werderm. Espostoa laticornua Rauh & Backeb. in Backeb. Espostoa laticornua var. atroviolacea Rauh & Backeb. Espostoa laticornua var. rubens Rauh & Backeb. Espostoa procera Rauh & Backeb. in Backeb. Description: Espostoa lanata (a.k.a. 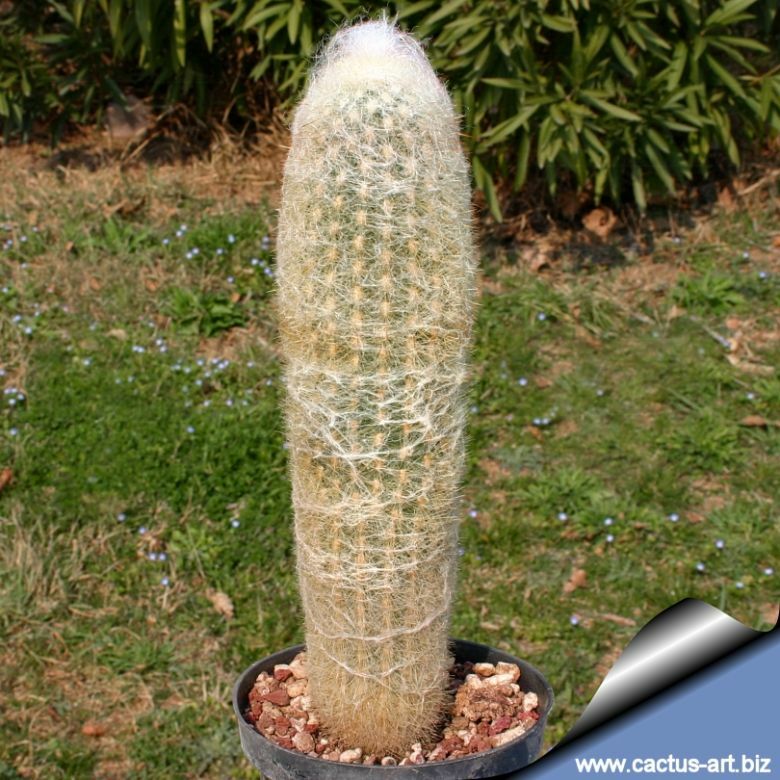 Peruvian Old Man Cactus) is a slow growing tree shaped cactus branching at the top with age, 1,5 to 7 m tall. 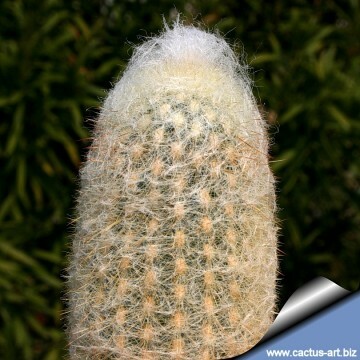 Like Cephalocereus senilis (the Old Man of Mexico) it is a densely hairy species, covered by a warm woolly coat and well adapted to high altitudes, the main difference is the presence of sharp spines on Espostoa. It is wide spread in in habitat and quite variable in size and spines for this reason it has received several names. Stems: Cylindrical, erect or spreading, 6-10 cm in diameter from a short trunk (approx 1 m tall up to 20 cm in diameter). Ribs: 18-25, low rounded, separated by linear furrows, approx 5-8 mm tall. Areoles: Elliptical, closely set, 7-10 mm apart, almost concealed by white or yellowish hairs and spines. The hairs are neatly brushed, cunningly concealing the sharp spines that are a trap to the unwary. Central spines: Absent or sometime1, 1-2.5 cm long. Radial spines: 30-40 acicular, spreading, reddish or yellowish brown, turning grey as they age, 3-8 mm long. Flowers: The flowers arises from a lateral pseudocephalium up to 1 m long, 4-5 ribs wide, with brown or grey spines and wool contrasting with the snow-white spines on the rest of the body. The flowers are nocturnal, funnelform, nearly hidden by the wool, up to 5,5 cm long and 3,5 cm in diameter, white to purple. Small scales on the ovary and flowers tube, have long silky, caducous, hairs. Blooming season: Late spring, early summer. Fruits: Top shaped, near spherical approx 2,5 cm in long and in diameter, purplish-red, very juicy, sweet and edible. The colourful fruit project from the woolly mass of the lateral cephalium and are a startling sight. Seeds: Very small, black and shining. Espostoa huanucoensis H.Johnson ex F.Ritter: has tubular growing stems up to 2(-3) m tall. Areoles with white or yellowish hairs and spines. Lateral cephalia covering 5-8 ribs, 1-2 m long. Distribution: Huanuco, Peru. Espostoa huanucoensis f. cristata hort. : Crested form. Espostoa lanata (Kunth) Britton & Rose: has columnar stems branching with age, 1,5 to 7 m tall. Its stem is almost concealed by a warm white woolly coat. Cephalia up to 1 m long, 4-5 ribs wide. Distribution: Southern Ecuador, northern Peru. Espostoa lanata f. cristata hort. : Crested form. Espostoa lanata subs. lanianuligera (F.Ritter) G.J.Charles: has robust tubular stems 3-5 meters tall, branching from near ground level up to half of the plant height. Lateral cephalia reddish to orange. Distribution: Cajamarca. Notes: Espostoa is considered by some authors a monotypic genus, by others it include 4 species. 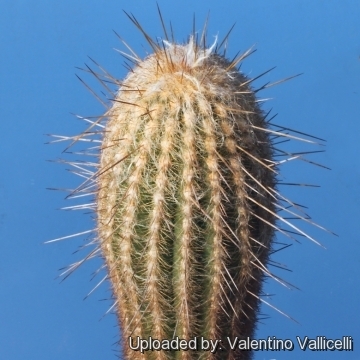 Cultivation and Propagation: Espostoa lanata is a summer-growing and easy cactus to grow. It makes great potted specimens.